For many metal fans out there, Rob Rock is a man that needs no introduction. He has performed for numerous metal acts dating back to the mid 1980's. Actually, the list is quite long: M.A.R.S., Angelica, Driver, Joshua, Axel Rudi Pell, Impellitteri, Warrior, and Avantasia. In my humble opinion, any project that Rob Rock has been involved with has been a quality project: the man has not released a bad album in his career. Eyes of Eternity is another quality album to add to Rob's discography. This is Rob's second solo album, the follow up to the 2000 release Rage of Creation. Rob has actually taken the title of that first solo album and applied it to his band's name. This new "solo" band is now known as "Rob Rock's Rage of Creation." From the opening riff, one thing is evident. This album is much heavier than the Rage of Creation album. That album leaned heavily on the melodic hard rock side of things. Eyes of Eternity is much more in the US Power Metal style, but executed in a refreshing manner. While I enjoyed Rob's previous solo offering very much, I did hear (and read) several fans criticize the album for lacking originality, not much different from anything he has done in the past. In all fairness though, HALF the songs from the Rage of Creation album were written from 1989-1990 during Rob's days in Driver with Roy Z. Well, all those fans who share that opinion can rest assured with this new offering. This album sounds less like a rehash of Rob's previous works, and sounds more like the "next chapter" of his career. Despite the increase in tempo, each of the songs still contain the addictive melodies that fans have come to expect. The guitars on this album are much heavier than the Rage of Creation album, and nearly all of Rob's previous work for that matter. Roy Z still contributes his guitar work and songwriting on this album, and handles the production. Naturally, Rob's vocals are the shining point of this album. His delivery is still boiling over with emotion and intensity. The slower moments, especially during the 12+ minute epic, The Hour of Dawn showcase Rob's incredible talents. The guitar work on this album is hard not to like. During the aforementioned epic track, The Hour of Dawn, several well known guitarist make guest appearances, including Gus G., Jack Frost, and Axel Rudi Pell. Rick Renstrom and Bob Rossi, along with Roy Z handle the guitar work for the remaining tracks. Crunchy, aggressive riffs and quality solos can be found all over this album. Keyboards are used at points throughout the album which help to differentiate the songs, without becoming a dominating aspect of the music. Of the 9 tracks on this album (11 if you want to splurge for the Japanese edition), there are no weak tracks. The 12+ minute The Hour of Dawn is an interesting listen just to hear the many different guitarists contribute their solos. However, this track does become somewhat tedious after several listens. I like the fact that Eyes of Eternity feels much less like a "copy-paste" from Rob's prior projects (and other bands), and more like a new chapter in Rob's career. Fans of any of Rob's previous work can easily jump on this latest offering from one of metal's elite vocalist. 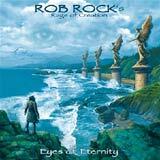 Eyes of Eternity sees Rob Rock kicking up the intensity of the music, while not forgetting his melodic roots. Furthermore, this album captures the personality, power, and inspiration that seemed to be lacking from the Rage of Creation album. With this notable improvement from Rob's first solo album, I am confident that we can continue to expect outstanding albums from Rob in the future.